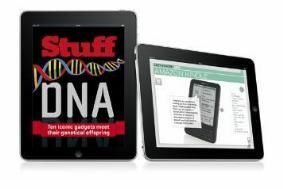 Stuff magazine launches 'Stuff DNA' iPad app | What Hi-Fi? What Hi-Fi? Sound and Vision's sister magazine, Stuff, launches its first iPad app – Stuff DNA. How did we get from one to the other? Where, for example, does the germ of the iPad itself lie in the Asus Eee PC? All is revealed, using videos, graphs and interactive features – all custom-designed for iPad. And What Hi-Fi? Sound and Vision won't be far behind: iPad owners can look forward to some special things coming later this year from all of us here at Whathifi.com.